What happens when we execute python -m SimpleHTTPServer 9000? To answer this question we should understand the construct of SimpleHTTPServer (https://hg.python.org/cpython/file/2.7/Lib/SimpleHTTPServer.py) and BaseHTTPServer(https://hg.python.org/cpython/file/2.7/Lib/BaseHTTPServer.py). """Test the HTTP request handler class. print "Serving HTTP on", sa, "port", sa, "..."
Hence here the port number, which the user passed as argument is parsed and is bound to the host address. Further basic steps of socket programming with given port and protocol is carried out. Finally socket server is initiated. 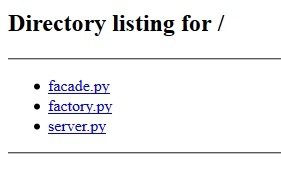 The links https://hg.python.org/cpython/file/2.7/Lib/BaseHTTPServer.py and https://hg.python.org/cpython/file/2.7/Lib/SocketServer.py are useful for finding further information. Running this command serves the files of the current directory at port 9000. If no argument is provided as port number then server will run on default port 8000. The -m flag will search sys.path for the corresponding .py file to run as a module. The SocketServer module provides the classes and functionalities to setup a network server. SocketServer's TCPServer class sets up a server using the TCP protocol. The constructor accepts a tuple representing the address of the server (i.e. the IP address and port) and the class that handles the server requests. The SimpleHTTPRequestHandler class of the SimpleHTTPServer module allows the files at the current directory to be served. Save the script at the same directory and run it. The '-m' flag will search 'sys.path' for the corresponding '.py' file to run as a module.